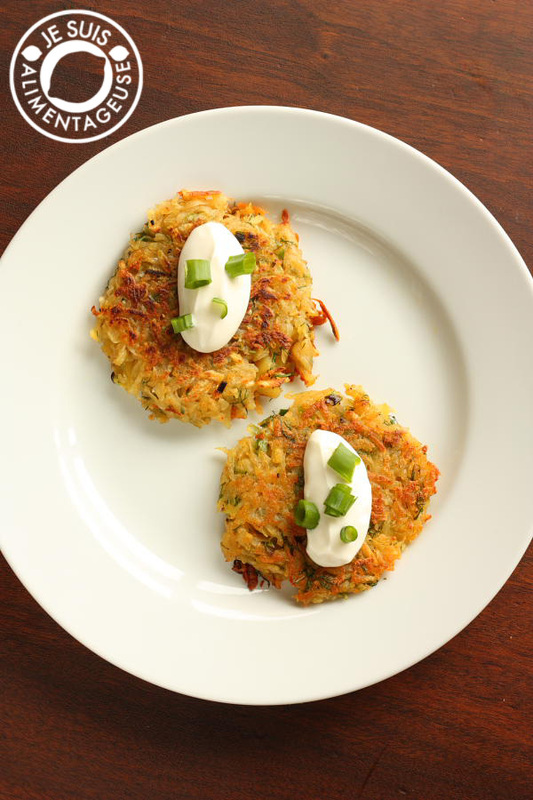 These wonderfully crispy scallion potato pancakes are sure to knock your breakfast out of the park. Some of you may have seen it on my Instragram feed a while back. It’ll take your taste buds where no taste bud has gone before. That is, unless you’ve previously had latkes, which I have not. But these are more than your average potato pancake. They have scallion. They have dill. They’re wonderfully crispy, and when served with a dollop of sour cream (vegan or not), it is divine. I could go on about these pancakes, but honestly, you just need to use up some ol’ potatoes you’ve got lying around and make em yourself to really understand what I’m talking about. Now, this post originally started out so differently. I originally had like 1000 words about how Star Trek and other sci-fi franchises are essential for open dialogue and awareness of humanity’s morals and values. Then I started ranting about Man of Steel and how I felt about it. In a nutshell, I’ve been watching far too much Star Trek: Voyager when I should be working on my thesis. And Man of Steel was nothing to write home about. Go see it for yourself to support the film I guess, because the action scenes in it are pretty epic, but the script. BLAH. That one deserves a rewrite. But you know what’s been making me curious? The lack of participation from you lovely readers, both on the Facebook page (check the sidebar) as well as on the blog. On occasion, some of you will comment, which is lovely! I love it when you ask questions, or point out typos/inconsistencies. It warms my grammar-fanatical heart. And I ESPECIALLY love it when you give me feedback about how a recipe has turned out. In the meantime, make these pancakes for a crispy treat for breakfast. They’re vegan (if you use vegan sour cream or omit it entirely), and contrary to popular belief, potatoes are pretty healthy for you if you’ve prepared them correctly (meaning you haven’t deep fried the heck out of them). Now this recipe requires a bit of oil, so it’s not the healthiest recipe, but heck, it’s better than going out for some hash browns that have been deep fried for nearly 3 minutes. Plus it’s way more delicious. And for those who have been following my fitness progress, here’s a little update! I started to plateau with the reps that I mentioned in my Vegan Green Tea Cupcakes, so I started alternating rep days with yoga days. Check out my Facebook page for the yoga flow videos I’ve been doing. Some of them are really intense, but I also shared a relaxing flexibility-based one too. I’ve lost about 3 lbs in the last month, but I’ve also gained a lot of muscle. My arms are definitely more muscular, and my legs are gettings more toned. I think waist has gotten a lot smaller, although I should have measured myself in April to be sure. My abs are actually starting to show through my more form-fitting shirts. I’m even starting to find random daily chores a lot easier, like the trash seems easier to carry or groceries are easier to manoeuvre! Haha. I’ve been able to do tricep pushups lately, which was nearly impossible for me before. Same goes for side planks in yoga. I did not have the upper-body strength for that earlier. I haven’t been swimming because my cousin has been staying with me for a couple weeks, but with the hot weather lately, I’ll be going again starting this week. So enough about me. Here’s the recipe! Squeeze the grated potato to strain out the liquid. The drier the potato, the crispier the end result. Add flour bit by bit, scallions, dill weed, and spices and mix together. The mixture should be able to clump together, if too wet, add more flour, if too dry, don't add the full 1/4 cup. Preheat a non-stick skillet/pan over medium heat and add the vegetable oil. Arrange clumps of the potato mixture to the pan (be careful of the oil splatter) and cook until the bottom edges brown. I did two mini pancakes at a time. Flip and cook until both sides are brown and crispy. Remove from the pan and let rest/drain on a paper towel. Serve with a dollop of sour cream (use soy based sour cream if you want to keep it vegan) and top with more scallions or chives. So tell me what would make you want to comment? What deters you from commenting on my blog/FB page? I wish I could tell you what makes me want to comment or not comment! It usually has more to do with me than the blog itself. I go through phases where I want to comment on every blog post that has given me value (usually to express my gratitude, e.g. to thank them for sharing a delicious-looking recipe, or if I'm feeling gregarious I'll answer a question that the blogger has posed), while most of the time I just don't feel like saying anything. I will say that I'm more likely to comment on a blog if the blogger is likely to reply, which is the case for your blog.The pancakes look good btw! Love the videos and blog. I am weaning myself off IHop and general toxic food groups. I found you on youtube doing the Vegan Lentil Patties. I usually try to post positive feedback in comments but not always because someone usually posts a comment I agree with. Don't take lack of responses as a negative. You are amazing and so much fun to watch. Thank you for sharing! I am anxious to try all your recipes they look yummy. Thanks for the comment <3 Even if you feel like your comments would be repetitive, if other YouTubers are anything like me, they read all the comments, and hearing something nice enough times makes you feel a lot better. Yum, these are really delicious. I served these with plant-based yoghurt seasoned with onion powder, chopped dill, salt, pepper and a few drops of lime juice. Thank you!